April 4th, 2019: RØDE Microphones is proud to announce the launch and shipping of the Wireless GO digital wireless microphone system – the world’s smallest and most versatile digital wireless mic/receiver combination. Wireless GO will be showcased at NAB 2019 in Las Vegas, US, April 8th -11th. The RX is just as compact, measuring only 44mm x 46.4mm x 18.5mm and weighing just 31g, which makes your rig that much easier to carry and facilitates mounting on a range of camera gimbals and stabilisers. Its dual-purpose mount sits snug in your camera's shoe mount, or clips easily onto your camera strap or an item of clothing. The supplied 3.5mm TRS output cable plugs into your camera's audio input or, with the relevant available RØDE adaptors, into your recorder, GoPro, iPhone etc. There is also a three-stage output pad -- 0dB, -6dB, -12dB -- to tailor your output to your camera or recorder. The Wireless GO's quick clip-on capabilities make it perfect for run-and-gun journalists and vloggers in the field: never miss the action as it happens -- no cables and great sound. RØDE's market-leading smartLav+ (with an SC3 adaptor), Lavalier microphone and HS2 headset microphone are perfect companions for the Wireless GO when used as a belt-pack (and sold separately). "The Wireless GO is an incredible marriage of form and function, substance and style," says Freedman Group CEO Damien Wilson. "Pristine audio, versatility and build quality, and a price that will reset the marketplace. Video content is a vital part of everyone's business, and the simplicity offered by the Wireless GO's built-in mic means that everyone can produce broadcast-quality audio along with their vision: emerging filmmakers, reporters, real estate agents -- you name it. 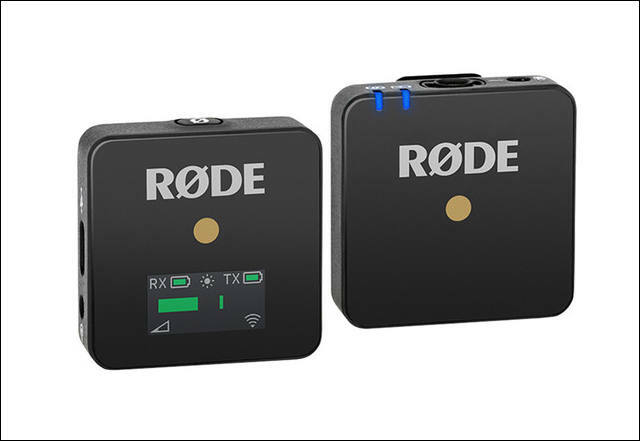 "For RØDE, Wireless GO is the perfect addition to our range of wireless solutions, which includes the bestselling RØDELink Filmmaker Kit," continues Wilson. "And it's another world-first in RØDE's fantastic run of innovative new products, following the 2018 releases of the RØDECaster Pro and NT-SF1 ambisonic microphone. We continue to identify capability gaps in the market and are determined to be first in the space with revolutionary pro audio equipment, built to deliver brilliant audio for creators around the world." Meet the Wireless GO (and RØDE's product specialist team) at the B&H booth (Central Hall C10916) at NAB in Las Vegas, from Monday April 8th to Thursday April 11th. The Wireless GO can be pre-ordered for US$199 (B&H). Poor battery life for a full production day, and no locking connection. Utterly unsuitable for a professional soundie as talent wireless. More like they have Chinese systems as competitior. I better get some of recent Saramonic systems or such, as they have much better build and locking connectors. And not live inside 2.4Ghz hell. On any big crowd places behavior of such systems is unpredictable. Add to this new trend of wireless ear buds that also work in same range now.